American cellist Julius Stenzel studied music and literature at Pomona College in California and moved to Brussels in 1977. 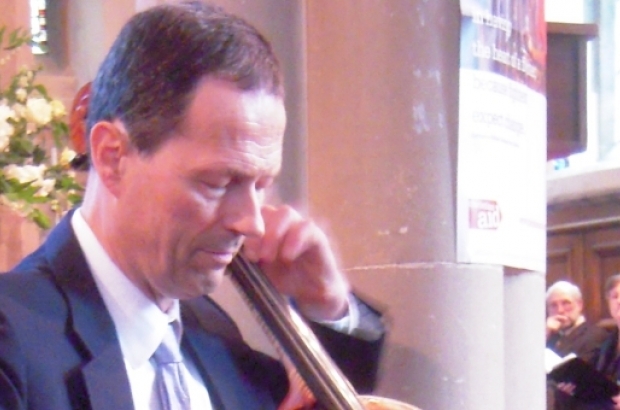 After playing for many years with the now defunct RTBF Orchestra, he divides his time between chamber music and teaching cello. He is also artistic director to two amateur ensembles, the Brussels Madrigal Singers and Chapelle des Minimes. He lives in Auderghem with his Belgian wife and two daughters and has just completed a two-CD recording of Bach’s cello suites. Yes, I hardly qualify as a newcomer anymore! My first impression of Brussels was very favourable. I was deeply impressed with the lavish art scene here. I still am, although Brussels hasn’t been spared the economic downturn and there has been some belt-tightening in the arts as well. The Madrigal Singers is a small a cappella choir, mostly made up of expats, that began back in 1973. It has a beautiful and adventurous repertoire ranging from Renaissance music to gospel. I see it as a kind of workshop that mixes experienced singers with others whose sight-reading perhaps isn’t so great but who learn a lot from the experience. The Chapelle des Minimes is an orchestra and choir that performs Baroque cantatas, mostly by JS Bach, in the Minimes church in the Marolles. It’s even more of a workshop, because there is more time to take people under one’s wing. The concerts take place once a month, right before Sunday mass, and they follow the liturgical year – the priest sometimes takes up on the cantatas. They are free and invariably packed. You see the same people coming back month after month. Some even sit on the same chair each time. We started the series in 1981, as an experiment, really. It was all very precarious. Nobody could have dreamt that it would last so long. But it gradually got better, and success begets success. Today, it’s a real institution, with a life of its own. For a musician, Brussels is a pretty exciting place to be, then? It is! The academies, which provide high-quality musical education for free or next to nothing, are a wonderful breeding ground. Then there are the European institutions, which draw many talented, dedicated people. I don’t buy this vision of fonctionnaires as lazy and boring. These people work hard at their jobs, and when they relax, they play music or go to concerts. I know because I have many among my students. Many expats like to gripe about Brussels and the truth is, one can always find good reasons to complain. But on the whole, the quality of life here is excellent. Let’s not kid ourselves: it’s a pretty good place to live.